In the context of this Magic Quadrant, cloud compute IaaS (hereafter referred to simply as "cloud IaaS" or "IaaS") is defined as a standardized, highly automated offering, where compute resources, complemented by storage and networking capabilities, are owned by a service provider and offered to the customer on demand. The resources are scalable and elastic in near real time, and metered by use. Self-service interfaces are exposed directly to the customer, including a web-based UI and an API. The resources may be single-tenant or multitenant, and hosted by the service provider or on-premises in the customer's data center. Thus, this Magic Quadrant covers both public and private cloud IaaS offerings. Gartner's two top leaders, AWS and Microsoft, didn't change for all the time from 2010 to 2018. But Google Cloud Platform has made to leader quadrant this year. IN: Alibaba Cloud, Amazon Web Services, Google, IBM, Microsoft and Oracle. OUT: CenturyLink, Fujitsu, Interoute (acquired by GTT in Feb), Joyent (owned by Samsung), Virtustream (owned by EMC), NTT Communications, RackSpace and Skytap. 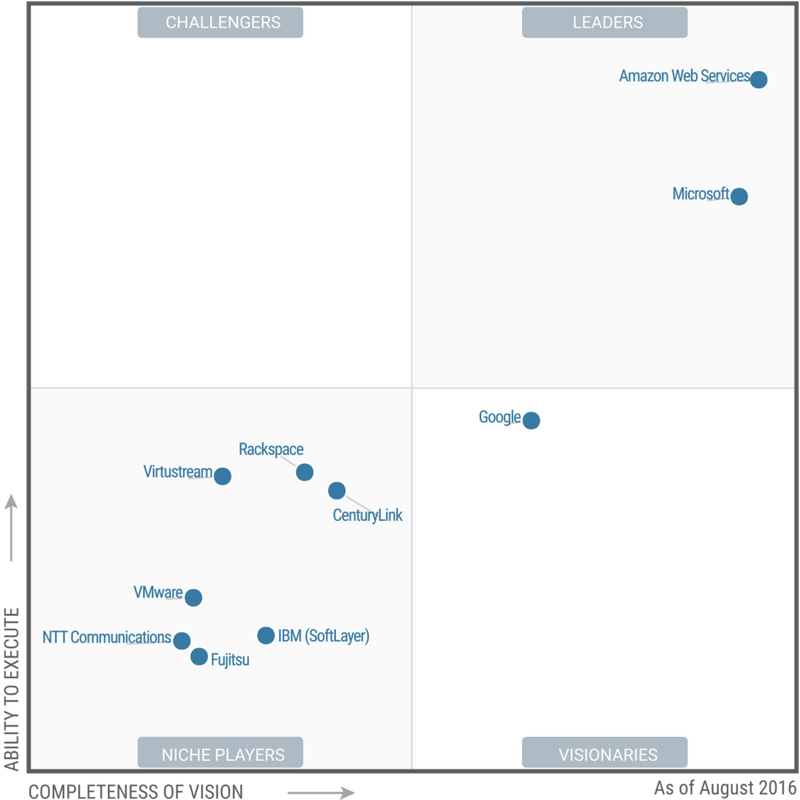 On Jun 15 2017, Gartner has published Magic Quadrant for Cloud Infrastructure as a Service that – no surprising – has Amazon Web Services and Microsoft alone in the leader's quadrant, same as last few years. 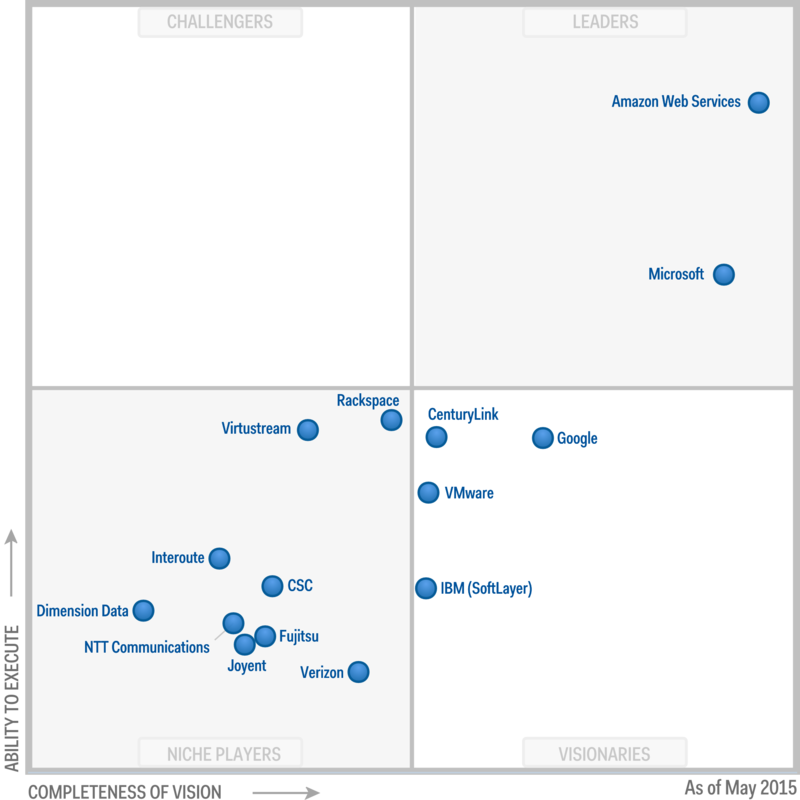 In the 2016 Magic Quadrant for Cloud Infrastructure as a Service, Worldwide, for the 6th straight year, Gartner placed Amazon Web Services in the “Leaders” quadrant and named AWS as having both the furthest completeness of vision and the highest ability to execute. 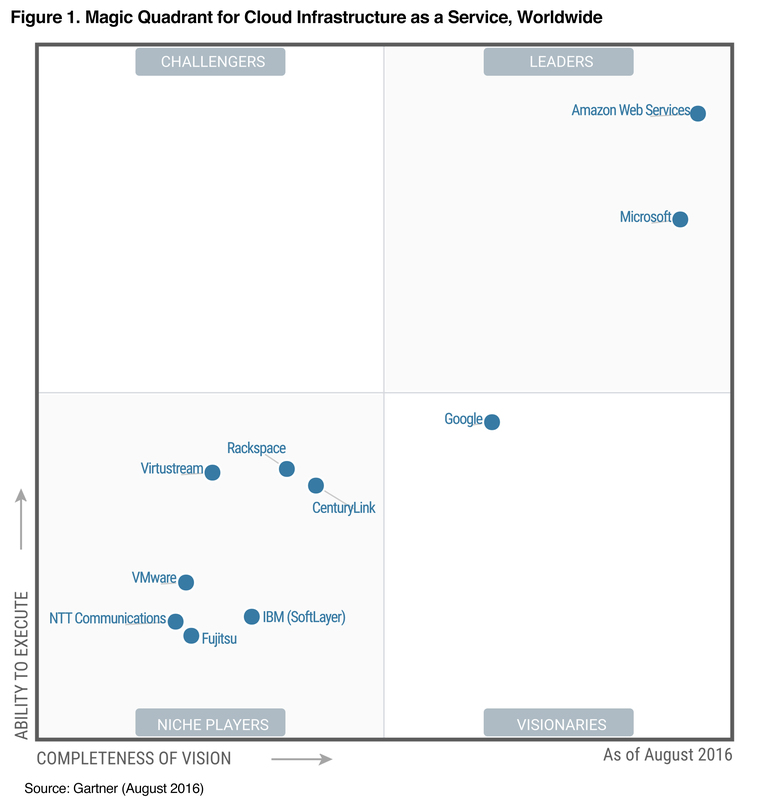 In the publication "2015 Magic Quadrant for Cloud Infrastructure as a Service, Worldwide" Gartner Amazon Web Services ranks in the "Leaders" quadrant and appreciates AWS both the completeness of its vision and the most pronounced ability to implement them. According to the report, Microsoft’s Azure cloud service is already making significant inroads despite the fact that it only launched the IaaS component of its business into general availability a little over a year ago. Very detailed information provided. The gartner magic quadrant shown with the help of the graphs and diagrams are very efficient to understand the concept clearly.